Location: From Ulm B311 44km to Obermarchtal, turn right to Zwiefalten. From Reutlingen/Tübingen B312 to Zwiefalten. At the road between Zwiefalten and Hayingen, 3km north of Zwiefalten. Open: APR to OCT daily 10-18. NOV to MAR by appointment. Fee: Adults EUR 4, Children (6-13) EUR 3.50, Children (2-5) EUR 3, Children (0-1) not allowed. Groups (20+): Adults EUR 3. Guided tours: L=70m, D=10min, V=35,000/a , completely by boat. 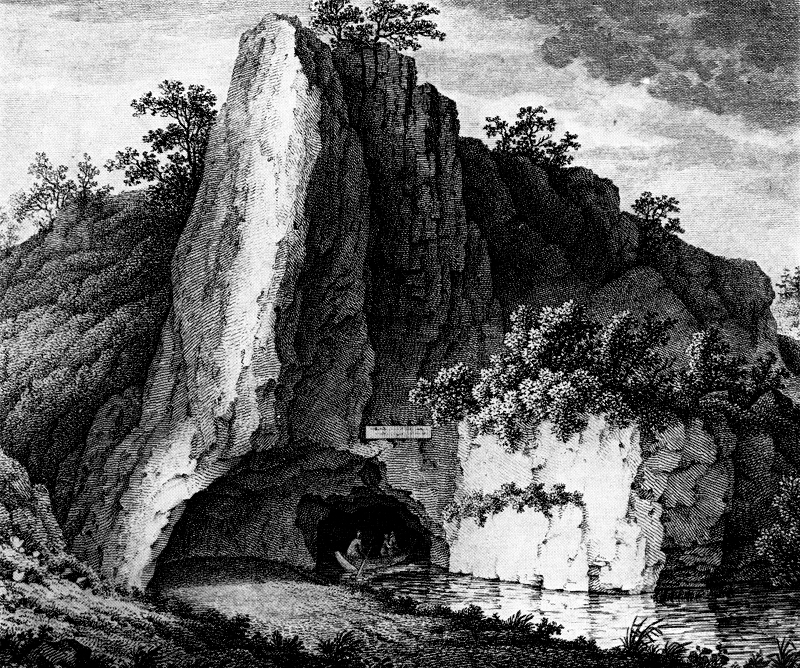 Image: view from inside to the cave entrance. 09-AUG-1803 visited by Kurfürst Friedrich I. von Württemberg. 1910 first survey of the cave by the topographer Haug. 1953 first explorations by divers of the group Eschenbach - Göppingen. 1959 first dive through the siphon at 90m by Gerhard Wellhöfer and discovery of 200m more. 1964 survey of the new part by Alexander Wunsch and Jochen Hasenmayer. until 1975 various dives with the discovery of 400m more by Jochen Hasenmayer. since 1995 survey and exploration by the cave diving clubs HFGK and INGO (later HFGOK). Image: engraving by August Seyffer (9.8.1774-14.8.1845). 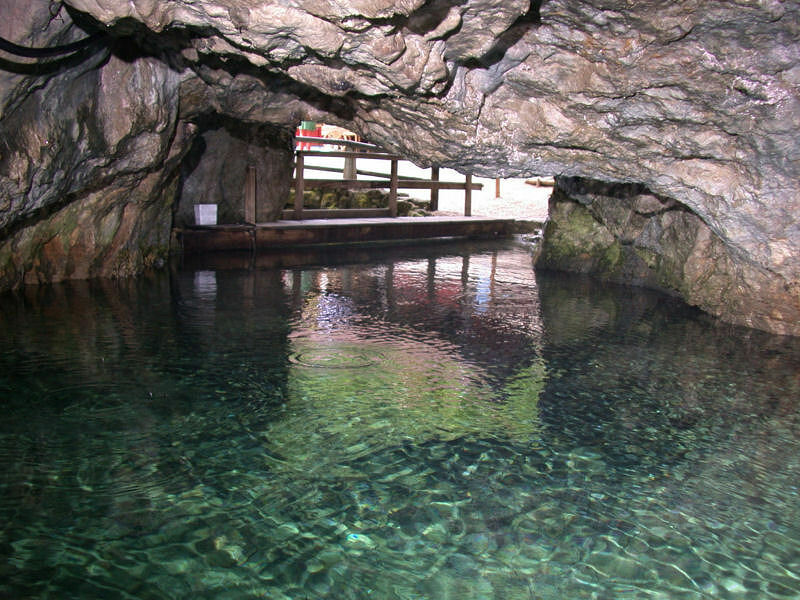 The cave of Wimsen is a spring of a small river called Zwiefalter Ach, which is a tributary to the Danube. It is located in the Glas valley, the river Glas flows into the Ach only 50m from the cave entrance. 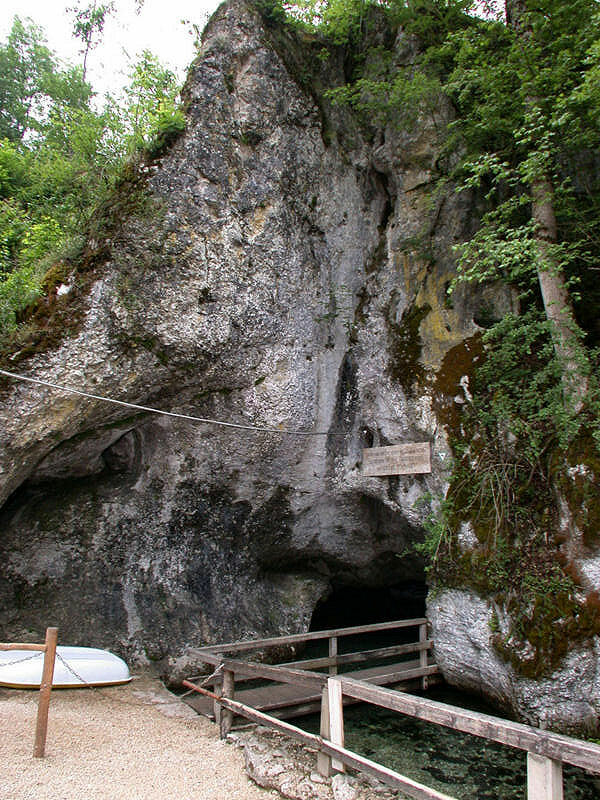 It is the only show cave in Germany which is visited by boat. 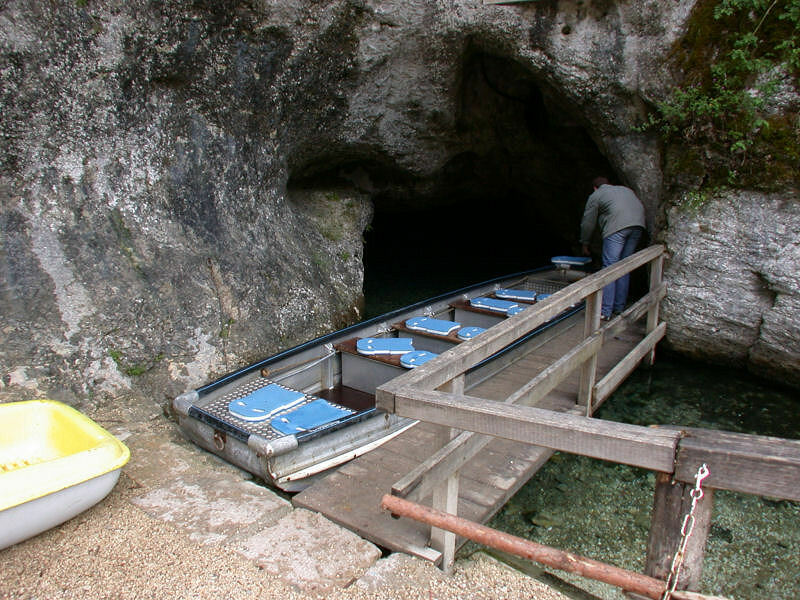 Only 70m of the cave can be visited during the tour, so it takes only 15 minutes, in aluminium boats seating up to 10 persons. 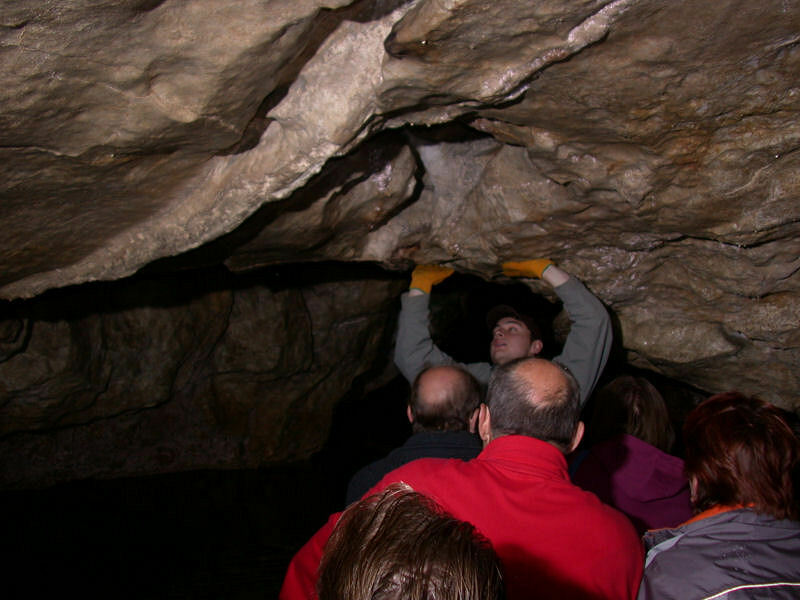 After the tourist part the cave, the ceiling goes down and the rest of the cave is only accessibe to cave divers. As the cave is rather narrow and the diver's sight is reduced extremly by clay sediments, diving is very dangerous and rarely done. 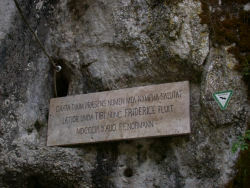 Image: the poem above the cave entrance. Grata tuum praesens numen mea nympha salutat. Laetior unda tibi nunc Friderice fluit. Thankfull cheers my nymph the high visitor. Gladder flows for you, Friedrich, the brook. 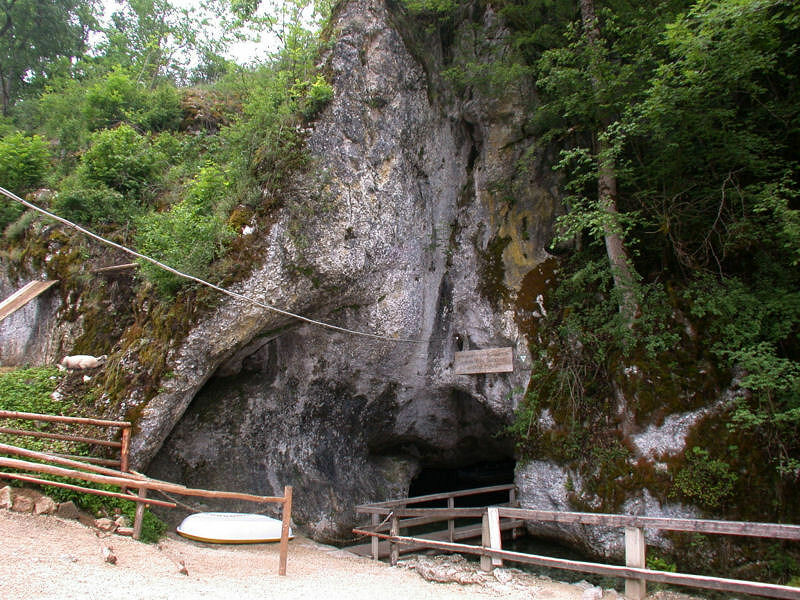 The Friedrichshöhle is not closed in any way, and the entrance area is rather big. 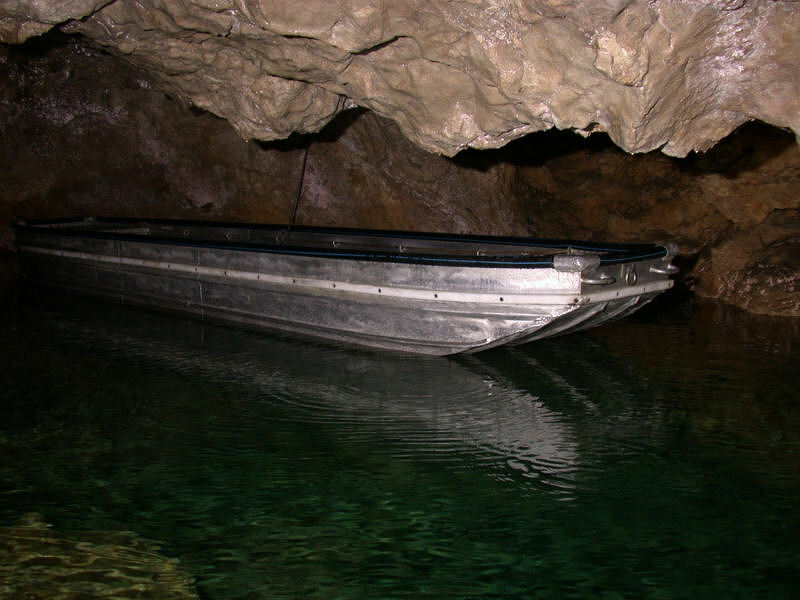 Its easy to enter the cave in a small boat. This is a result of the mill below, the water was dammed for the water wheel, probably several hundred years ago, and the cave river became a higher level. Obviously the cave was entered by wooden boats for centuries. But all explorations ended soon, at a sump only 70m from teh entrance. 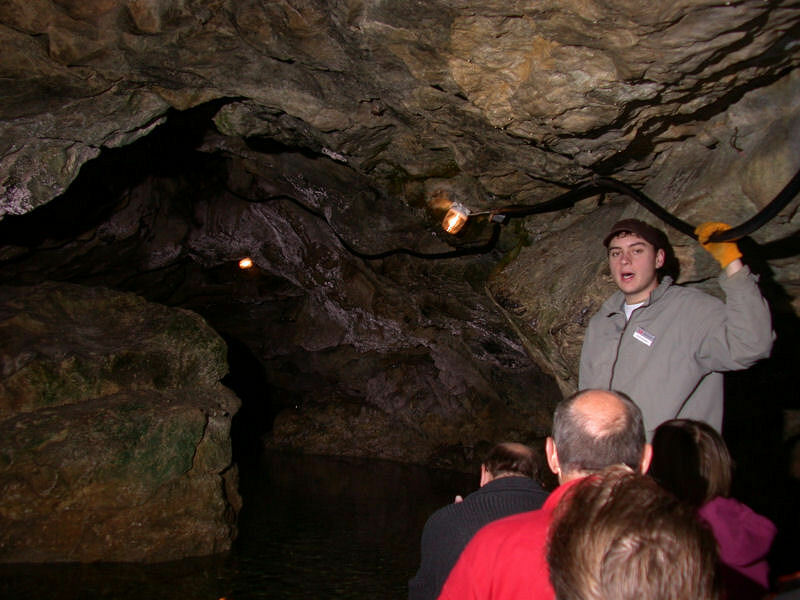 Serious exploration started during the 1950s when the sump was crossed by cave divers. 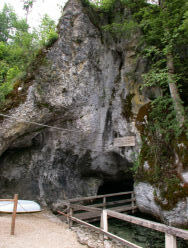 The most famous German cave diver, Jochen Hasenmeyer, was involved over several years and made important discoveries. After the first sump a 200m long dry passage follows. Then a second sump follows, which is pretty deep and was impassable for many decades. It was finally crossed in 2006, and another dry passage was discovered behind. But the dive is extremely difficult and dangerous, it will probably be the last for a long time. 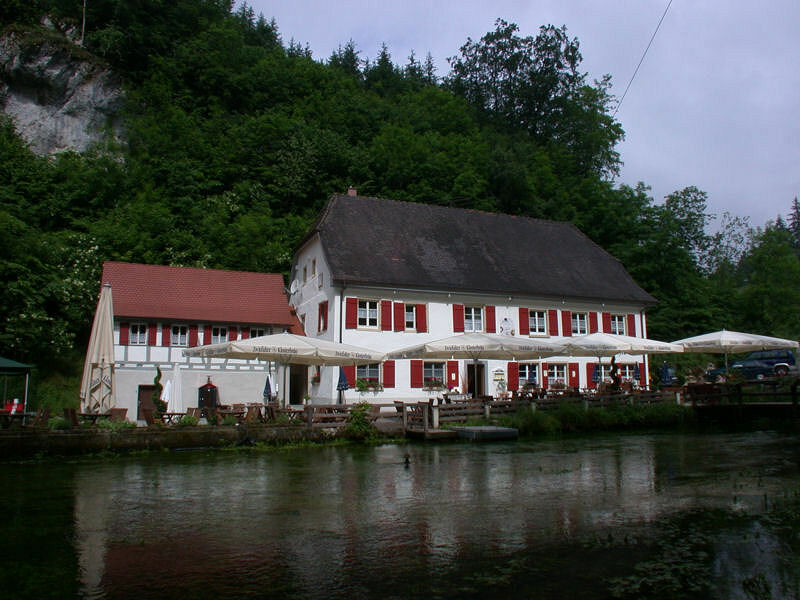 Wimsen is not a village, it is a former water mill with an inn, which belonged to nearby Schloß Ehrenfels. 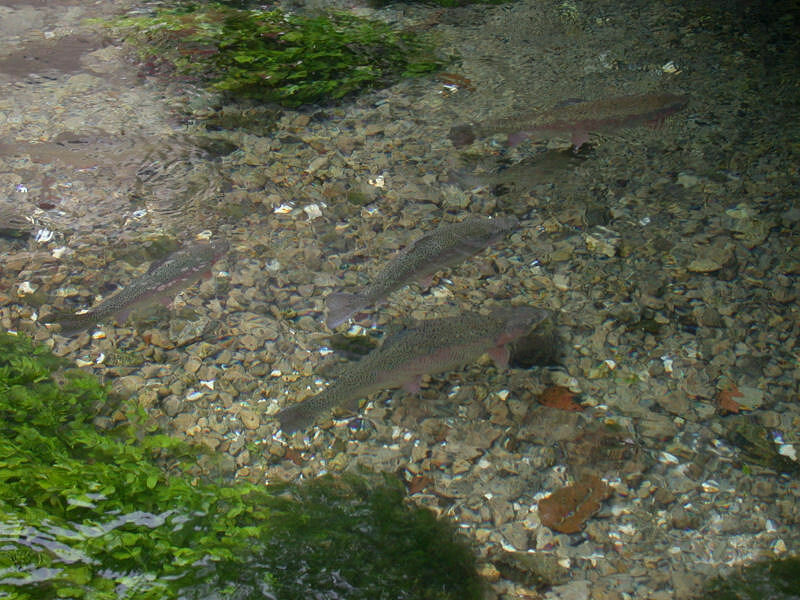 The inn has a small trout breding, which uses the water of the cave river. The menu of the inn contains numerous palatable trout dishes. Search Google for "Wimsener Höhle"